I am very pleased with this jacket by Magnoli Clothiers. 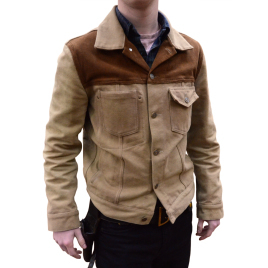 My boyfriend is a huge fan of 'The Walking Dead' and I had done countless searches for Rick's jacket online. It was impossible to find the Levi's version which was discontinued, but I was thrilled when I contacted Indy and he said he could replicate it just like the show (which was even better!). He was great at keeping me updated and always responded promptly. It took longer than he originally estimated but it was definitely worth the wait. He was determined to get every detail just right and wasn't going to send me something he wasn't totally satisfied with, which I really appreciated. It fits my boyfriend perfectly and it's his favourite gift by far!